I can’t tell you how many times I’ve had a “spiritual experience” sitting at my dining room table enjoying a quiet, solitary bite to eat of something either savory or sweet. There are times that food can be so utterly delicious in the most simple way, so gloriously beautiful in all of its flavors and colors, that I genuinely can’t help but utter a little prayer of gratitude out loud: “Thank you Father for this food that You provide; thank you for allowing me to taste even a bite of the spectacular flavor of this part of Your creation; and thank you for giving me at least a humble understanding of how to put it together in such a way that I may find some joy and pleasure in the experience of eating it, and even in sharing it with others.” And I’ll tell you, when I do indeed find myself reflecting on what a real gift good food is in my life, I can’t help but realize in that moment that I wish I were “consciously grateful” more often. In a world of scurrying and hurrying, we all too often grab morsels of food and half-consciously shovel them into our mouths just to simply stave off the painful rumblings in our tummies, and don’t really take much time to sit and enjoy and reflect a little on that precious food and the fact that it does, indeed, bring us so much in the way of pleasure; doesn’t it? Sitting with a plate of something delectable in front of us, savory or sweet, and truly enjoying each bite as it goes down, can be a genuine spiritual experience, if we really consider it. Existence would be impossible without food, and so to be present enough to have the awareness that it comes in such beautiful packaging, in such vivid palette-pleasing flavor when put together well, is to be aware of the love that our Creator has for us; for the pleasure that He, in fact, longs for us to experience through what He joyfully has provided for us. And that, to me, is utterly and divinely sweet, indeed. The warm summer season provides some richly colored and juicy options for our taste buds to explore; gem-like berries — ruby-red and bursting with a refreshing, tart-sweetness — sit proudly in their containers just longing to be sliced and liberally added to anything that can benefit from their punctuating presence. 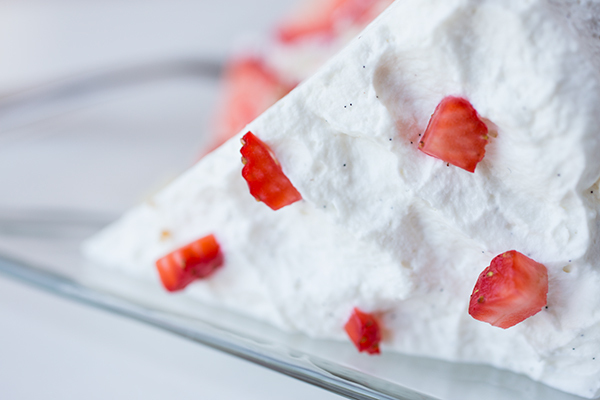 Light, fresh desserts are perfect for this time of year, and taking the time to enjoy something as simple as a bowl of ripe, chilled, fragrant strawberries dipped into a small dish of fresh, vanilla whipped cream can provide the reminder that heaven can, in fact, be tasted here on earth, from time to time. So delicious, yet so very simple. And a tasty little treat like that can boldly color the imagination to go further and to create out of that place of gratitude and pleasure, and to build upon it a couple of more layers. 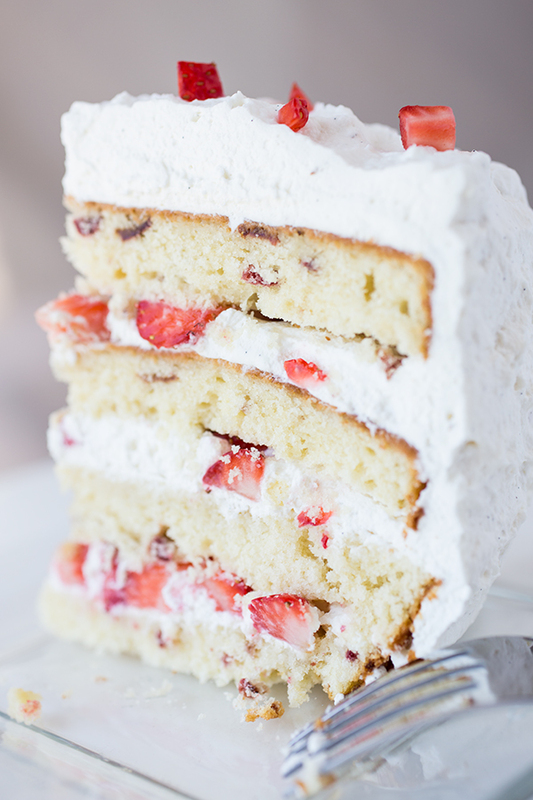 And in this case, those “layers” turn out to be sweet, delectable cake layers that form a fluffy Strawberries ‘n Cream “Cloud” Cake. 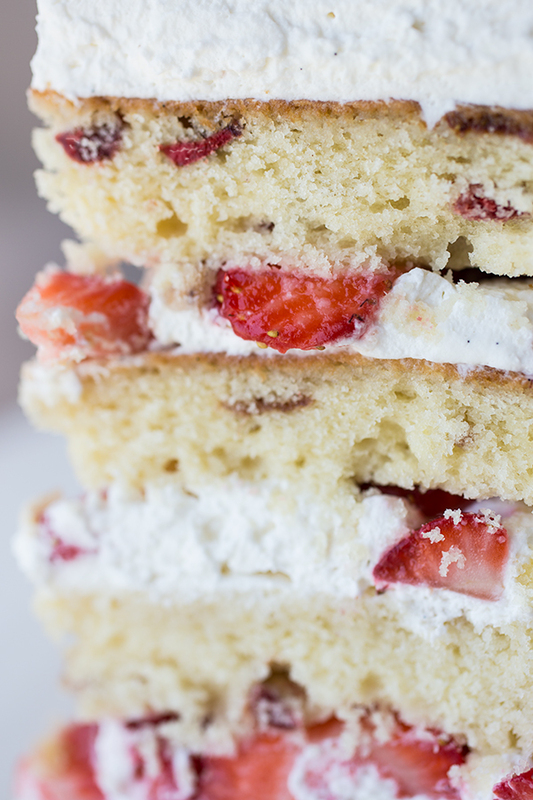 Moist and light, this perfectly summer-y cake is filled to the brim with rich vanilla-bean whipped cream and sweet strawberries, and soaked with a fragrant Chambord simple syrup. 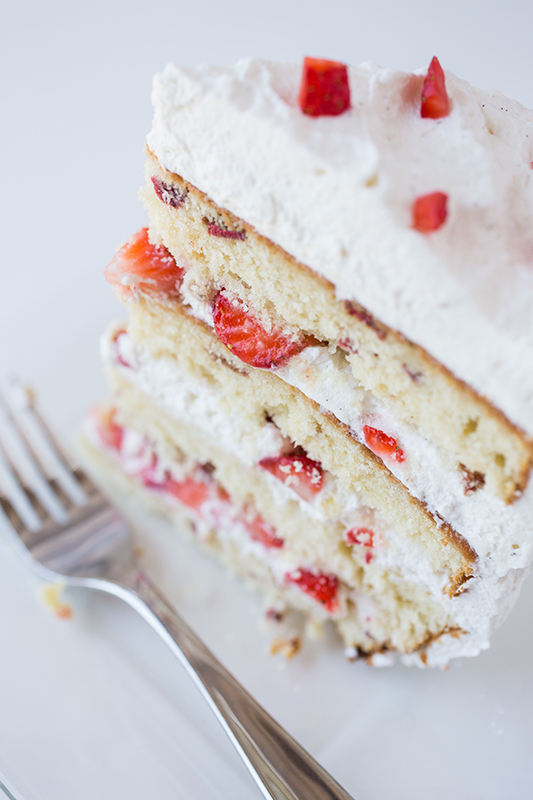 And so to sit still with the proper time to indulge and take in all of the lusciousness and sweetness that a slice of this cake can provide, is to have a “spiritual experience” of the sweet kind. Thank God for the gift of a good dessert. To experience good food simply “melting away” on the tongue, is to experience pure bliss. 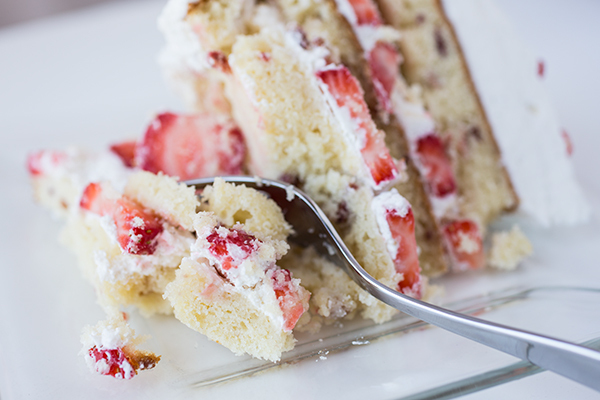 The fact that a simple slice of sweet, moist cake, made with ingredients whose flavors burst in the mouth, can remind us of God’s desire for His creation to experience joy and pleasure in the simple things, is something to consider and luxuriate in. There are many ways for each of us to have our own “spiritual experiences”, our own unique moments of awareness and understanding of what is divine; and when we do have them, may we each remember Who we belong to, and may our souls be filled with gratitude for the fact that we can, indeed, experience a spiritual moment over a little, sweet slice of cake. -Preheat the oven to 350°; prepare two, 9” cake pans by lightly buttering them and lining them with parchment rounds, and then lightly sprinkling in some flour on the bottom and on the sides, and tapping the excess out. -To prepare the cake batter, begin by sifting together the all-purpose flour, the cake flour, the baking powder, baking soda and salt into a medium-large bowl; set aside these “dry” ingredients for a moment. -Next, add the softened butter and the sugar to the bowl of a electric mixer fitted with a paddle attachment, and cream the two together on medium-low speed until very pale and light and fluffy (for about 5-8 minutes), scraping down the sides about half-way through (be sure to take the time to cream the two thoroughly, as it will help create a lighter, more “airy” cake). -Once the butter/sugar is thoroughly creamed, begin adding the eggs in one at a time, allowing each to be fully incorporated into the butter/sugar before adding in the next one; next, add in the vanilla extract and allow it mix in. 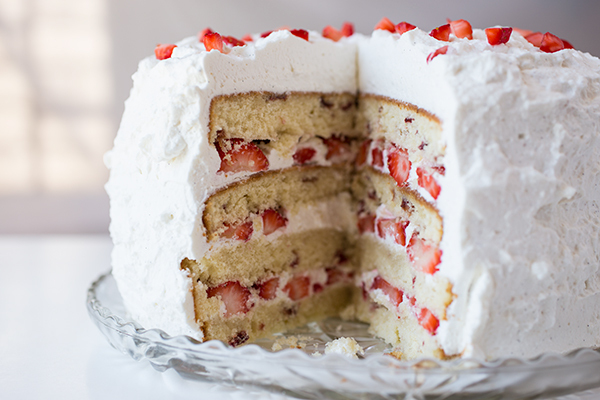 -Next, reduce the mixer to low speed, and begin adding the “dry” ingredients and the buttermilk, alternating the two, beginning and ending with the flour; mix only until all ingredients are blended in, being careful not to over-mix the batter; finally, gently fold the chopped, freeze-dried strawberries (if using) into the batter. -To finish and assemble the cake, cut any unevenness off of the tops of each cooled cake (a “dome” for example, or the bubbly “skin”), and cut each cake in half horizontally through the center to create 4 thinner layers (reserve the two layers that have the flat “bottoms” from the cake pans to use as the top two layers of the cake for a prettier, more even finish); place one of the cut layers (with it’s most even side up) in front of you on a cake stand or large plate, and with a pastry brush or spoon, add a generous amount of the Chambord Simple Syrup to the cake layer to moisten it well; next, add a generous amount of the Vanilla-Bean Whipped Cream and smooth it out with a off-set spatula or knife, and then arrange about 1 – 1 ¼ cup’s worth of sliced strawberries over the whipped cream; repeat the process with another layer; then for the third layer, use one of the two “flat-bottomed” layers you set aside, flat side up, and repeat the process with the simple syrup, whipped cream and strawberries; with the final layer, finish off by adding only the simple syrup and then just frosting the outside of the entire cake generously with the remaining Vanilla-Bean Whipped Cream; add a few sliced strawberries on top for garnish (perhaps indicating where each slice is), and store in fridge to keep very cold. Serve fresh, and cold. -In a small sauce pan, combine the sugar and the water, and bring to a simmer over medium heat; once it has simmered, turn the heat off and stir to completely dissolve the sugar; cool the simple syrup completely (you can place it into the fridge to expedite the process), and once cooled, add in the Chambord liqueur, stir to combine; keep covered in fridge until you’re ready to soak the cake layers with it. I couldn’t agree more. This was lovely in every way. Thanks for the reminder to take the time to be amazed and awed by the great variety of colors and flavors the Creator has given. What a beautiful, wondrous gift! Thank you for your comments Courtney; and may we truly take pleasure in His gifts, indeed! Do you have any substitution suggestions if you don’t have access to freeze dried strawberries? Hi Hillary! 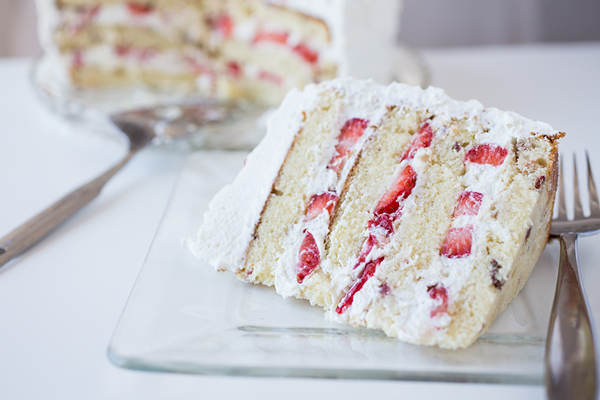 I have the freeze-dried strawberries listed as an “optional” item, so you can very easily leave them out completely if you can’t find them; and don’t worry, it won’t compromise the flavor of the cake at all. (There really isn’t a “substitution” for them, as fresh ones would release too much water.) Hope you give this recipe a try, and enjoy it! Freeze dried strawberries can also be found in a mix at Costco (little bags for snacking). Made this yesterday. Moist, deliciousness dessert that was a big hit with all who ate it. Only problem was serving it. The layers kept falling off each other. 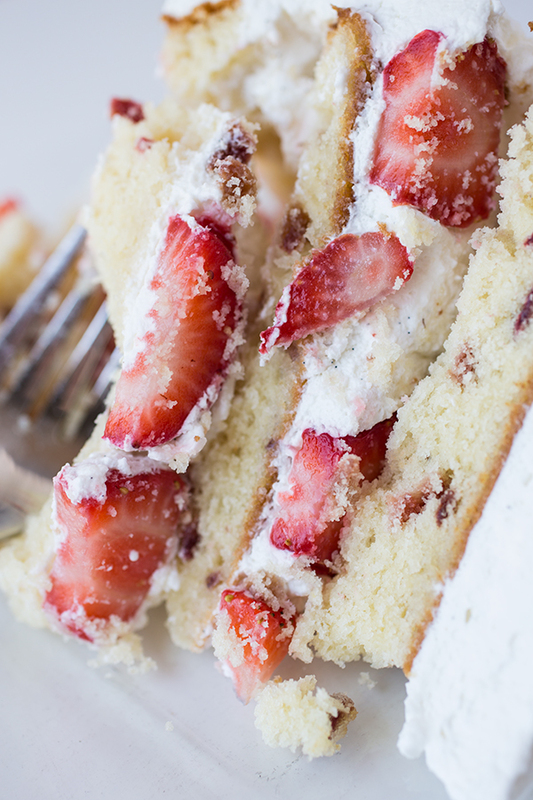 Whipped cream doesn’t ‘glue’ layers together like frosting. Don’t think I would change the recipe but will have to take a lot of care serving it. & the chamboard syrup really adds a loverly note. May use that in other desserts! Hi Tammy, I’m thrilled to read that this cake was a hit for you! And yes; it’s true that the whipped cream is a little lighter and therefor doesn’t “glue” things together quite like a butter frosting would, but like you said, if you serve with a little extra care, it’s worth it. Thank you for sharing your experience with me! You can find bags of freeze-dried strawberries at Target 😉 Can’t wait to give this cake a go for Easter. Patt, that’s a great tip—thank you! Hope you enjoy this!